iSatori’s Mission is to create the most loved, talked-about, well-respected, and sought-after nutritional products and solutions for building a better body and living a stronger, healthier, richer life. The smaller 45 gram version got great reviews from buyers, especially regarding taste and texture. It’s easy on the stomach and you don’t have to drink a lot of water with it. Reviewers compared the taste a lot with that of a candy bar with a much better nutritional profile. The flavor is apparently very good, because many people stated that they had to look on the wrapper to believe it’s a protein and not a candy bar. It also leaves no weird aftertaste. Chewy, crisp and easy to swallow according to most buyers. Some even compare the texture to Twix/crunch bars. Doesn’t get stuck in your teeth. 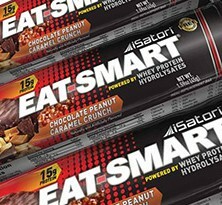 Eat Smart bars have more vitamins and minerals than the average protein bar. The ingredient profile could be a little better when compared to other leading brands though. For a 45g bar Sodium is a little high. With $2.50 at retail price per 45g bar, you are way better off buying the 80g bar for $2.62 with almost double the amount of protein. As always, don’t pay retail and look out for discounts online.